Click on the image below for a comprehensive Mercator Sky Map including the distribution of the main visible constellation in the sky. This is a 1.4 Mb PDF file to be formatted to be printed on a A4 size sheet of paper, utilize the highest print quality in your printer for best results. 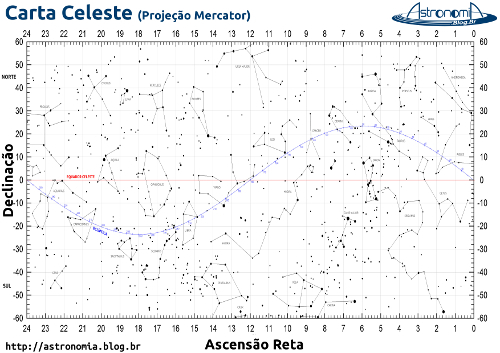 Due to the distortion provoked by flattening spherical surfaces such as the planets or the sky, the Mercator Sky Map increasingly distorts the view further north or south of declination zero, therefore, this kind of sky projection has significantly less stars in declination higher than 60 degrees north or south, which is a region in the sky that we decided not to show in this map. On planet earth by comparison, geographical locations further north or south are disproportionately bigger compared to other lands closer to the equator. Greenland takes as much space on the map as Africa, when in reality Africa’s area is 14 times greater and Greenland’s is comparable to Algeria’s alone. Alaska takes as much area on the map as Brasil, when Brazil’s area is nearly five times that of Alaska. Finland appears with a greater north-south extent than India, although India’s is greater. Antarctica appears as the biggest continent, being infinitely large, although it is actually the fifth in terms of area. The Mercator projection is a cylindrical map projection presented by the Flemish geographer and cartographerGerardus Mercator in 1569. It became the standard map projection for nautical purposes because of its ability to represent lines of constant course, known as rhumb lines or loxodromes, as straight segments which conserve the angles with the meridians. the Mercator projection distorts the size and shape of large objects, as the scale increases from the Equator to the poles, where it becomes infinite.